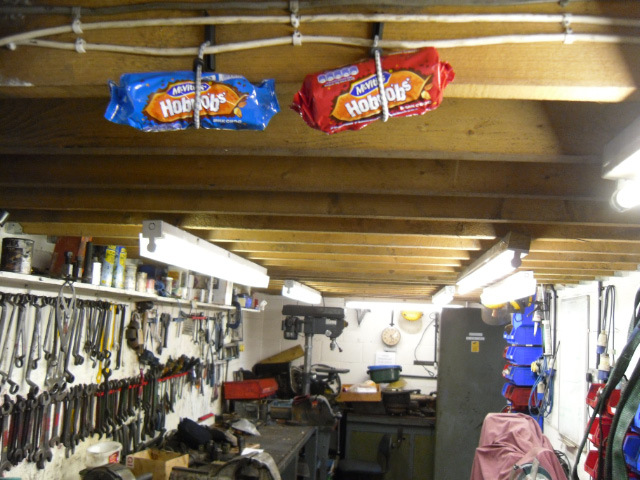 A quiet day today with me opening up the workshop to be greeted by 2 packs of Hobnobs dangling from the ceiling, one dark and one milk chocolate. Lucky man! It was grey and cold, and poured with rain in the morning. No more fatalities to report. Derek Shorten joined me and, after a warming brew, set to work all day continuing with the cleaning of the wheels and frames outside and inside. It is a never ending job, but with some new scrapers, a lot more muck was removed. I continued cleaning the carbon off the L/H valve. Ian arrived about 11am, and met me at the signing on point as I had to leave for a meeting at Darlington. Ian continued cleaning the L/H valve until lunch time, and as it was a bit cool for the outside picnic area, Derek and Ian retreated to the A4 cabin. After completing the L/H valve Ian started on the R/H one: the ring and outer part are now clean with lots of hard carbon removed. However, there is still lots of carbon to remove from the rest of the valve. Jon Bradley missed out on the Hobnobs this week, but at least he kept warm as he was driving the B1 on the 1030 ex Grosmont as it slipped past us on the way to Pickering. The locomotive is not likely to get on the wheeldrop until the Green timetable kicks in after the Easter holiday, and there has been a meeting between Paul Middleton, Andy and Paul Hutchinson to agree the programme for the rest of the overhaul. The new flue tubes will be ordered after Easter, and advice is being sought on whether the elements should be renewed or are suitable for re-use. No working party this weekend, but next Wednesday as normal. See you then - have a good Easter break.